Whether you’re the one receiving treatment or you’re caring for someone who is, it’s easy to feel overwhelmed. It could be caregiver stress, caregiver burnout, patient stress, or patient burnout or any other name for it -- but the fact of the matter is that you should be taking just as good care of your emotional well being as you are of your physical. And that’s not always easy. It’s always important to make sure you’re taking care of your physical health, but this shouldn’t come at the cost of your mental health. Everybody’s different, but these 9 simple tips should help you get and stay on the path of a healthier emotional wellbeing. Following these actions, recommended by a support group facilitator, can help you take a little more control over your emotions and happiness. The peace of mind that comes with knowing you understand the doctor and she/he understands you is amazing. Your doctor wants you to be as healthy as possible, so there’s no need to hesitate when it comes to asking questions. You’ll feel less stressed knowing that you’ve been understood and the doctor will be able to help better with a clear idea of how you’re feeling. Our top tips for reaching this communication nirvana? Ask a lot of questions. Seriously, when in doubt ask. There are no wrong questions. Not 100% confident about something your doctor said? Ask. Couldn’t understand an acronym? Didn’t catch the potential side effects of a treatment? Concerned about your specific medical history? Ask, ask, ask. This is almost a no brainer. Because of that, people sometimes forget about it. Your physical and mental health are closely linked so taking care of one will help you take care of the other. Eat well. I’m not a registered nutritionist or dietician, so I can’t tell you how to eat. But general rules of thumb are to avoid too much sugar and processed food and to eat as many fruits and vegetables as you can. If you’d like more detail, there are plenty of services out there that can help you get healthy food. Wellist has hundreds of options including grocery delivery, grocery stores, and meal delivery. Services like Savor Health, Community Servings, and others can provide professional consultations or free and subsidized meals. Try a stressbuster, like meditation. I’ve written about meditation, mindfulness, and their positive effects on mental health before. It’s a simple and free way to relieve stress, improve your thinking and can even help with depression. Here’s another great way to make sure your emotional well being is getting the attention it deserves. It’s easy to fall into a funk when it can be so exhausting to see people. To combat this, let people know the best times and places to meet with you. Your friends and family will be more than happy to meet you where you are. Make some sacred time for being with the ones you love. Consciously carve out time that will be spent how you want. This one goes back to communication: Let others know the best ways they can help out. Your friends and family want to help. They want to feel useful and support the one they care about (you!). Give them the gift of being helpful by letting them know how they can best help, whether that’s helping with gardening, cooking, walking the dog, or anything else. To improve your feelings you have to get in touch with them. This is easier said than done, however. It can be a little intimidating and might be hard at first, but understanding how you’re feeling helps you figure out why you’re feeling that way. Ultimately, if you know you can start to take steps to feel the way you want to. Starting a journal. When you have a strong emotional reaction to something, write about it. Putting words on paper can help you figure out how you’re really feeling and why. It can also be a soothing experience, helping you calm down if it was a negative emotion or helping you remember the good feelings if it was a positive emotion. Chat with other people. Connecting with others, whether that’s through a support group or mentor program, is invaluable. There are highly specific groups out there with people who have similar experiences to you. It’s easy to read about this sort of support, but sometimes getting going is a little harder. If you’d like professional or group support for any of these consider looking into Wellist. We’ve found thousands of services (many of which are free or subsidized) that can provide you with the resources you need to get to a happy and satisfying emotional state. Want to keep track of these tips in a handy checklist? 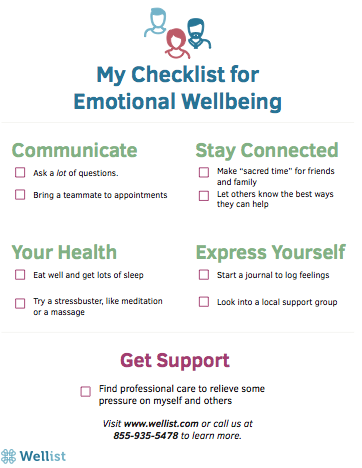 Download our printable checklist for free here.